During the disassembly of Cale's car I was able to closely inspect it. I believe I have found the root cause of Cale's accident. The following is an updated final analysis. I was an aircraft accident investigator for the US Air Force and I have some knowledge of automobile accident analysis. I was on track about 1500 feet behind Cale when the accident occurred. The following is my analysis and theory regarding the accident. November 9th, 2008. Entering Summit Point Main's Turn 1 normal braking zone on the far left edge of the track, Cale's car began the turn in to the right. The car then sharply reversed course to the left and began to slide while still on the track. The car then went three wheels off through the grass and gravel trap with the left front wheel on the access road. The car continued to slide across the access road and through dirt and grass until the right side of the car struck a bare concrete wall. The car hit with the right side approximately flush against the wall. The car came to a stop a few feet from the wall. The car was traveling approximately 128 MPH at the beginning of the braking zone for Turn 1. My data logger shows my S2000 at 125 at the braking zone and Cale's best lap time was about three 3 MPH average faster than mine. Cale was applying the brakes. The SCCA corner worker that worked Turn 1 said she saw the car did not decelerate and she noticed the brake lights were lit as he went by. This rules out driver incapacitation as the cause. A stuck throttle was not the cause. The post crash car examination showed the throttle butterfly was closed with the throttle cable working normally. Also, simply pushing the clutch in would allow the brakes to stop the car. A suspension failure did not cause the accident. All four skid marks on the pavement were uniform. A broken suspension would normally put more weight on the opposite diagonal tires and the skid marks would show heavier, darker marks. My car was behind Cale at the start-finish line when the accident occurred. My in-car video shows Cale's car in the distance entering Turn 1 from the normal position at the left edge of the track. His car then begins to move right into Turn 1 and gets about 1/3 of the way across the track but then rapidly reverses course to the left. Dust from the gravel trap is then seen as the car moves left and goes out of sight behind the trees. A small "flash" from the right side of Cale's car can be seen as he begins to turn right into Turn 1. I originally thought it was tire smoke, but when I examined the car all four of Cale's tires were still inflated--I actually checked the air pressure. After studying the video closely I see that the flash occurs when the car begins to turn right into Turn 1. When I looked at previous laps in the same session there was sun glint from the right side passenger windows from several cars as they began their turn in into Turn 1. I got a chance to examine the car and I went out to Turn 1 to look at the accident site two days after the accident. The skid marks at the track were easy to follow from the impact site at the wall back to about 50 feet up the track. I could not follow the skid marks any farther up the track due to a newly laid patch of black asphalt near the beginning of the turn-in point. As the skid marks come out of the asphalt patch the car was already in a four wheel slide with about 20 degrees of left yaw. All four tire marks are very similar and there's no evidence of any ABS--the skid marks are uniform and appear to be from the slide, not brake lock or ABS cycling. The car's brake fluid level was normal and all of the brake pads had plenty of material left. The car's right side brake rotors were both cracked which most likely was caused by the impact. 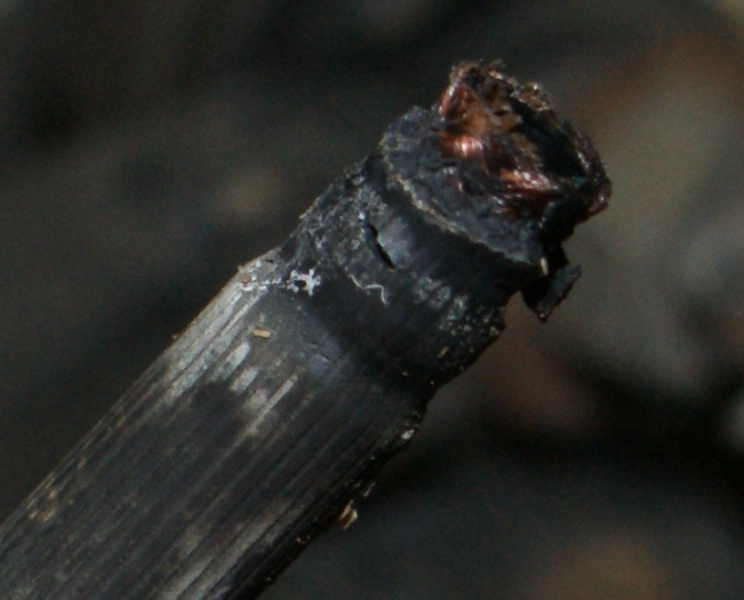 The rear rotor was completely broken from the hub, but too much of the rotor was found at the wall impact site to support a rotor "disintegration". We did a sweep along the braking zone and didn't find any brake parts but BSR had been running training on the circuit since the accident. The loss of a rotor can allow the brake caliper piston to fully extend which would allow the brake pedal to soften or even go to the floor, but there is actually a piece of brake rotor still sandwiched between the brake pads in both right side calipers. This would have prevented the caliper piston from hyper extending so the braking at the three other wheels would have been unaffected if the rotor had indeed disintegrated. 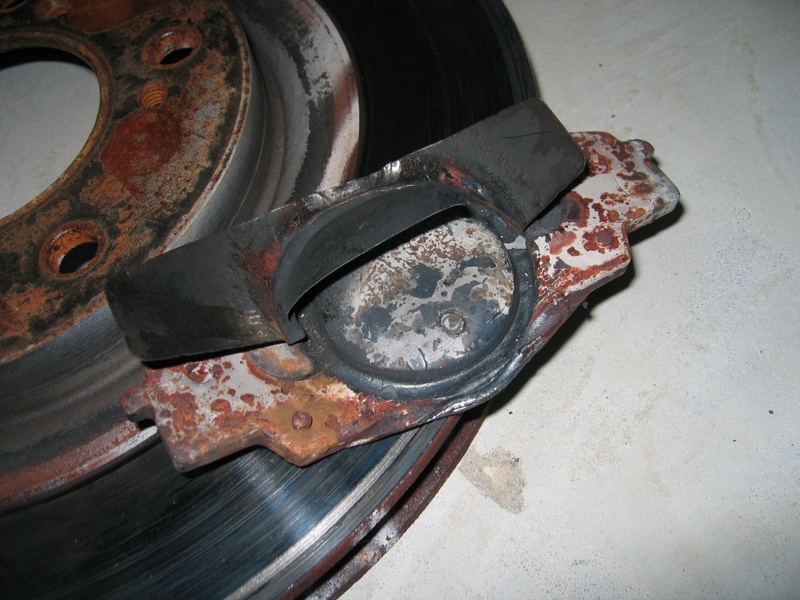 The brakes on the left side of the vehicle were in good condition with pad material still visible. When I removed the right side wheels to inspect the brakes I found only one point of failure for the entire brake system. 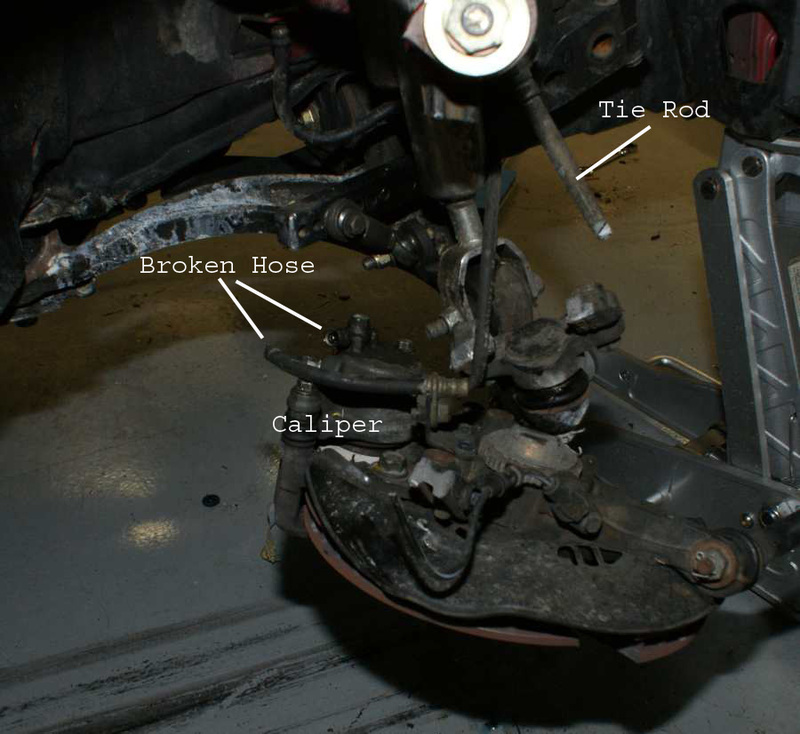 The right front brake hose had come loose where it connects to the caliper (see photos). It is possible the hose was pulled loose during the impact or when the car was moved from the crash site, but I believe this hose break is the root cause of this accident. 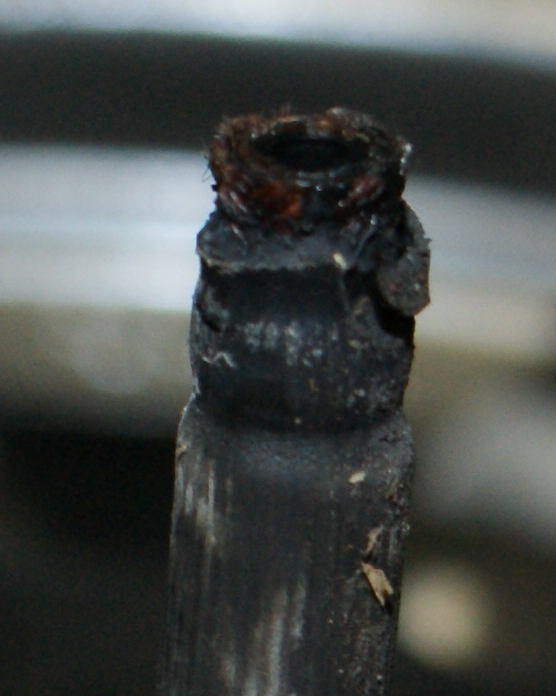 I believe the hose failed and popped out of it's hose end metal crimp when the brakes were applied at Turn 1. All four brake lines on Cale's car were the original, reinforced rubber brake hoses. The hose manufacturing date is still readable as 11/00, November 2000. 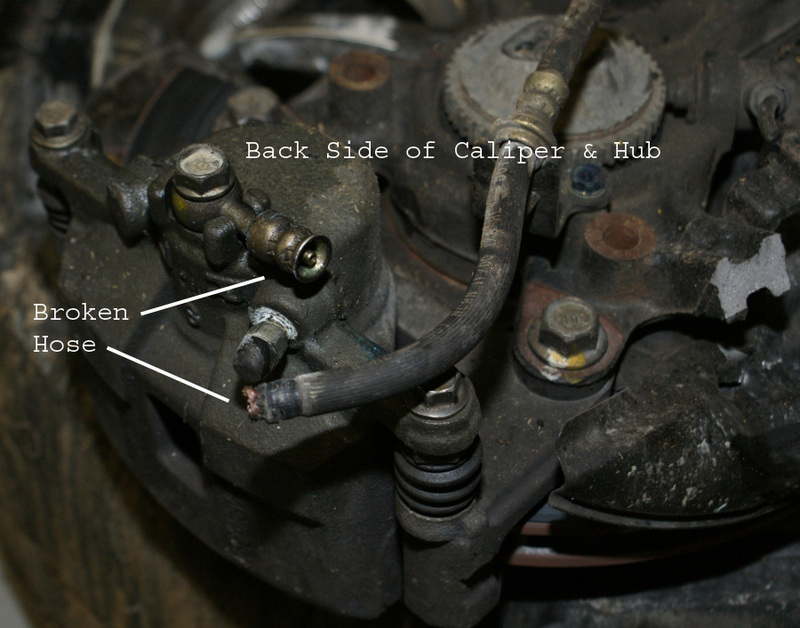 The brake line is stressed the most where it connects to the caliper. It is subjected to extreme heat during track and time trial events and over time would tend to weaken and rot. Notice the jagged and dirty tear in the rubber in the above pictures. I believe this is an indication of a slow failure that took place over time. If the hose was simply jerked out of the socket during the impact with the wall it would have a much cleaner and sharper tear. Also the hose tip would have a more uniform, smooth, and clean separation of the rubber. Last year on the Summit Point Shenandoah Circuit I had a brake failure in my S2000 which was caused by running the left front brake pads down to the backing plate, which caused them to overheat and melt. These were not Carbotech brake pads that failed. I have run a set of Carbotech pads to the backing plate and they did not "melt" like these pads did. The melted brake pad allowed the caliper piston to push into the brake pad backing material which together with the excess heat caused the left front brake piston seal to fail (the brake fluid leaking out of the piston actually caught on fire). The S2000 has a dual diagonal brake system, meaning if one circuit fails the opposite diagonal wheels will still have some brakes. When the failure occurred it felt like a complete loss of braking to me. Brake pressure to the left front and right rear dropped to zero. I was going just over 70 MPH in 3rd gear when I began to brake for the turn and the brake pedal went to the floor. I was not going to downshift for the turn so the clutch was engaged in third gear while I braked. Engine braking at 8000 RPM is very effective and helped slow me enough to make the pit entrance. I probably would not have been able to make the turn if I had had the clutch in. Very little braking is provided by the "good" diagonal braking circuit when a pressure loss occurs. Most of the brake pedal movement is used to displace the master cylinder's return spring. The brake pressure provided by the "good" circuit is nowhere near enough to lock the brakes or engage ABS. The video of my brake failure can be seen here: Rob's Brake Failure It does not appear Cale had even this much braking available. The corner worker confirmed that the right rear corner of Cale's car struck the last row of tires with the rest of the car hitting the bare concrete wall. The car's right side hit the wall pretty much flat against the wall while still in the slide. I estimate the impact vector relative to the occupant at about 60-70 degrees right. All the safety equipment was intact. The Sparco Evo seat, five point racing harness, custom four point roll bar and cockpit were not compromised and both airbags were deployed. After seeing the impact marks on the wall, and realizing the severe high speed side impact he took, I do not believe a head and neck restraint would have saved Cale's life. With the corner worker confirming that the brake pedal was pressed (brake lights on), the lack of deceleration, the speed at impact, and the skid mark evidence, I believe the brakes failed when the right front brake line popped out of the hose end crimp connector. This is the root cause of the accident. With the brake line loose the brake pedal would have gone to the floor and Cale may have assumed his brakes had completely failed. When one of the two brake circuits fail in a car with dual diagonal brakes like the S2000, the braking available from the left front and right rear is greatly reduced and would have been insufficient to engage anti-lock braking. 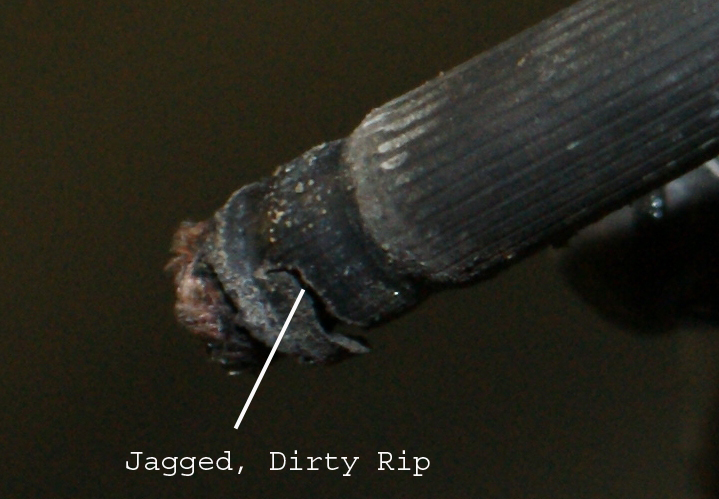 Two other Honda S2000 owners reported the same exact failure with the stock brake lines. Another owner reported the same failure with aftermarket stainless steel brake lines. 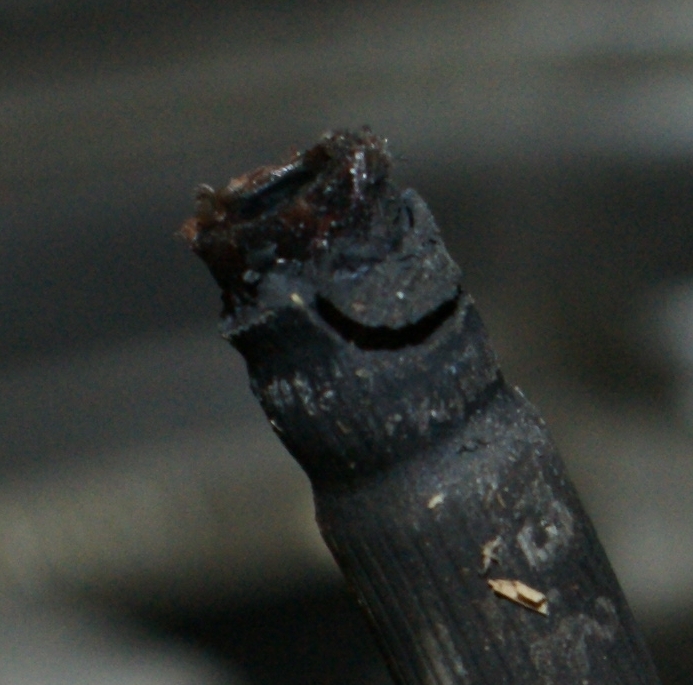 The hose crimp connection at the caliper seem to be a weak, failure prone part of the S2000 brake system. With the car in fifth gear there would have been little engine braking to slow the car. Cale may have had the clutch disengaged in anticipation of the downshift for Turn 1 which would have completely removed all engine braking. 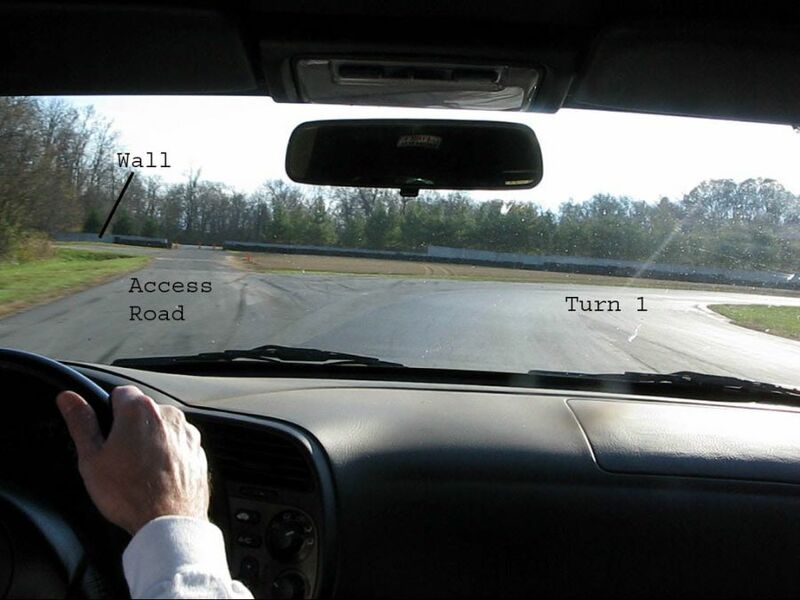 Cale initially began the turn to the right but then turned the car sharply to the left, perhaps to make the access road and its gap in the wall. It's also possible he began the turn in to the right with too much speed due to the brake failure, began to slide, over corrected and slid off the track to the left toward the access road. As the car slid to the left the left front tire stayed on the access road and the other three slid through the gravel trap. The car overshot the access road and slid through grass and dirt. The car hit a bare concrete wall on the far side of the access road, with the right side of the car approximately flush against the wall. The corner worker said the car came completely off the ground after impact and bounced away from the wall. That is consistent with what I saw when I drove by the accident site--I could see the right side of Cale's car as it was away from the wall. If you plan to track your car you should replace the brake lines at regular intervals with good quality stainless steel or Kevlar brake lines. Rubber brake lines will rot and fail over time, especially when subjected to the extreme heat generated on the track. I plan to be more cautious with my brake rotors and pads. I've always run my rotors until they have small cracks and push my pads until the very end, going metal to metal several times. I had always assumed the rear rotors were bulletproof since they are solid and the rear brakes don't take as much abuse as the fronts, but that doesn't appear to be true. The rear rotors should probably be replaced at least annually on frequently tracked cars.. While on the track if you are unable to make a turn and must go off track, it is usually best to go straight off into a gravel trap. Turning while going off track can lead to roll-overs or side impacts. The safety equipment in our cars is optimized for straight on impacts, especially if the airbags are still installed. Invest in quality safety equipment. Although you can run on the track with just a stock car and a helmet, consider adding a roll bar, racing harnesses, racing seats, and a head and neck restraint. Many of us have already purchased head and neck restraints since Cale's accident.